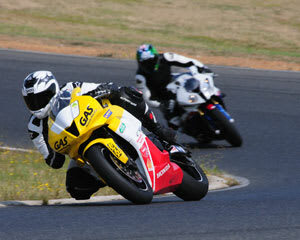 It's time to put you and your bike through their paces with this full day track experience at Broadford Raceway. Tired of dodging potholes, traffic and speed cameras? Then it's time you took your bike to Broadford to see how you can both really perform! This is a fantastic opportunity for riders of all abilities to get the most out of their bike in a controlled environment. In the morning there is a full safety briefing and you will be split into groups according to your riding experience (Beginner, Intermediate, Advanced) before your bike and safety gear are checked to make sure you are safe to hit the track! Each group will have one ride session per hour (15-20 minutes ride time) with three sessions in the morning and four after lunch. You are continually evaluated as the day goes on so you will have the chance to move up or down groups as the day progresses. This is a great day for you to get the most out of your motorbike as well as to improve your riding technique and pick up some great tips from the Marshals and other riders. This is a must do experience for all motorbike riders. The day was great well run and flowed really well! A big thanks to all the crew at Broadford, awesome.! Had a great day, despite the weather. I felt that the guys and girls put our safety first, and it was a very well run and organised day. I will be coming back again! A good day was had even though the weather was not the best.